Tackling Foul is a novel about a family history which takes place in the last decade of 20th century war-torn Serbia; its story, compassionate and heartfelt, about eccentrics, romantics and relentless fighters in the battle of life, is written with great charm and elegance, unparalleled in contemporary Serbian novel-writing. The author’s perspective of his characters is twofold: they are depicted in their home and family surrounding, and also in the historical impasse of Milošević’s Serbia. The warm and well-intended irony and humor are in fine balance with the ethical issues of the story. Kind and full of understanding, but not patronizing, with tongue-in cheek humor, the narrator’s voice is a highly original creation of Mića Vujičić. With this novel, the author ranks among the most talented novelists of his generation. This gentle and funny book makes its way to readers with its poetic repetitiveness and an appropriate metaphor of life - football, as well as with its representation of family life. The home is a place for the forming and losing of identities, for conflicts and their solutions; it is a place where anecdote and narrative, two seemingly opposite poles, intersect, producing a range of narrative varieties. In a world where combat is king, pastimes like football can become everything. Tackling Foul tells the story of a modern family living in their war-torn homeland of Serbia during the last decade of the twentieth century. The novel, written by Mica Vujicic, explores the family both within their domestic surrounding as well as their place in Serbian history under prime minister Slobodan Milosevic’s reign. The ethical questions posed in the story are handled with tongue-in-cheek humor and compassion, as the family discovers football as a metaphor for life. Mica Vujicic was born in Vojvodina, Serbia in 1979. He has a degree in Comparative Literature and Theory of Literature from Belgrade, where he studied for six years. He has been published in international news media, from newspapers in the rural village of Mokrin to Cut Magazine. 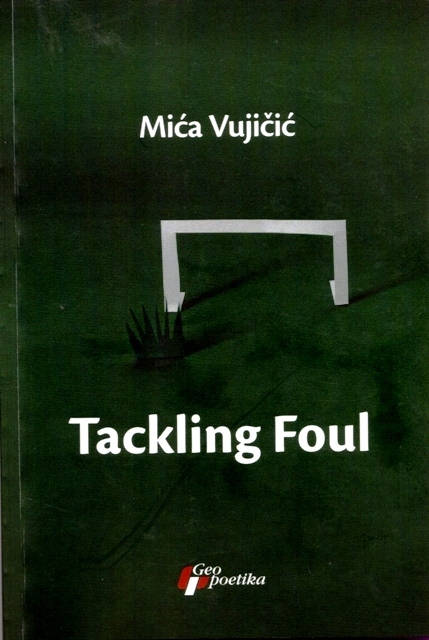 Tackling Foul, written by Mica Vujicic and translated by Randall Major, is a novel which chronicles events in the narrator’s life in war-torn Serbia in the late twentieth century in careful juxtaposition with soccer. Told through fluid snapshots of memory, the narrator uses witty prose to paint a picture of his family—a group of loving, quirk-filled, and at times, eccentric individuals—and in doing so explores their personal struggles in a time of national heartache. Over the course of the story we become well acquainted with the Twin, our narrators father, also referred to as the Ref; a lifelong soccer referee who has an inclination for math and geometry. We also are lucky enough to meet Uncle Sima, the Twin’s identical counterpart, a 6’ 6” giant who went missing during the war and is presumed dead. The well-rounded family doesn’t end there though, Mila, the narrator’s mother, is a colorful political activist with an affinity for new technologies. These individuals are brought to life with such clarity, through clever honest prose; you will not be able to put this book down. Composed of memories spanning the course of his life, the narrator remembers how Yugoslavia’s disintegration affected not only himself but his family; Tackling Foul is a loving testament to the human condition, creating vivid characters that don’t need penalty kicks to score points in your heart.